More focus on networks, communities, and informal power. Less formal change management; more choreography. Identifying and working through super connectors. Young leaders at the heart of change. 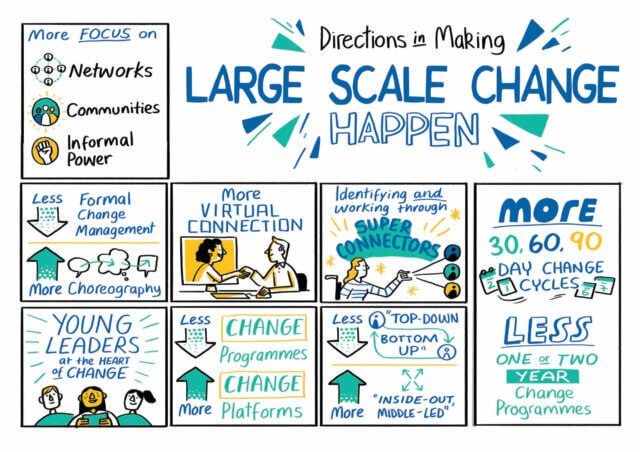 Less change programs; more change platforms. Less top-down; more bottom up and inside-out, middle-led. More 30, 60, 90 day change cycles; less one or two year change programs. Number 6. focuses on creating lasting process and culture that supports and normalizes change in an organization. This is a superior approach compared to the traditional lumbering change programs that are generally irrelevant long before they are “completed”. Number 8. emphasizes the importance of small, quick experiments. The hardest problems organizations face are chaotic and complex (the Cynefin model). Therefore, they require novel and emergent practices: experiments to learn more about how the problem areas respond to action and probes. I have one caveat. Number 3. “more virtual connection” is certainly appropriate if it adds to the repertoire and quality of connections. But be careful not to replace important face-to-face connection opportunities with virtual. Until we get the holodeck, virtual doesn’t provide the quality of connection and engagement that routinely occur at well-designed face-to-face events. This entry was posted on Monday, January 28th, 2019 at 6:51 am	and is filed under Facilitating Change. You can follow any responses to this entry through the RSS 2.0 feed.You can leave a response, or trackback from your own site.